Other service centers say that your Mac is dead, irreparable, too expensive to repair because you have to change the motherboard: we repair motherboard bringing to life even the products considered vintage. In our laboratories we are able to provide any assistance at every level, repair the motherboards declared irreparable, MacBook Air - Pro, Mac and Mac Mini and Mac Pro. Mac Macbook London repair quotes. We carry out any Mac Macbook London support: in our laboratory we are able to carry out any assistance at every level, perfectly repairing the logical boards (motherboard) declared irreparable death MacBook Air - Pro, Mac and Mac Mini and Mac Pro. Request your quote for Mac Macbook support! Apart from iPhone and iPad repair, we are also a Mac repair store. We provide technical support for all Apple products in the UK and can help you with all kind of upgrades, starting from MacBook SSD changing, RAM Upgrades .. to repairing Macs MacBooks without the signs of life. Our Mac specialists are certified by Apple and are experts in fixing Apple computers. That’s why we can offer a wide range of fast repair/upgrade services for Mac, MacBook, MacBook Pro, MacBook Air, Mac or Mac Mini in London and for almost everything we are cheaper than Apple. If the screen of your Mac has broken. We can solve it quickly and guarantee to be cheaper than the Apple store. We have certified Apple Mac technicians available at each of our locations so you can visit us today. We use the same spare parts as Apple. There are several Mac models, each of which uses a different screen. We can repair any model of Mac released since 2008, up to the latest 4K and 5K models. We will save you money on each model. How to significantly increase the performance of your Mac? The minimum amount of RAM that Apple places in an Mac, Macbook is now 8 GB of RAM. Until recently there were other 4GB Mac Macbooks, but I would say if you have less than 8 GB, you will see an increase in performance from the increase in RAM. iPhone Clinic provide RAM Upgrade in all models of Mac MacBook iMac. In general, terms, if you have an HDD hard drive in your computer and upgrade to an SSD, you will notice a huge difference in performance of your Apple computer. Your Mac will start much faster, the apps will load faster and, in general, your computer will feel much more responsive. 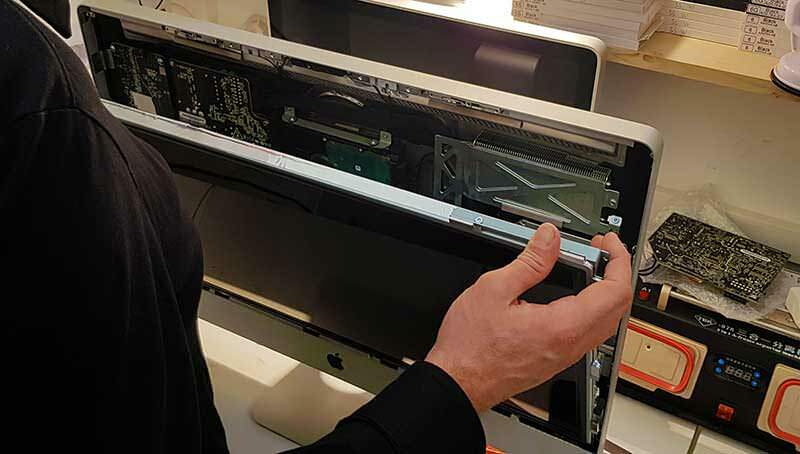 Our authorised Apple repair store can give you advice on what is the best size of SSD will feet for your Mac Macbook.